In the wake of the of the Goldman Sachs (GS) fraud case, Stone Fox capital decided to use the opportunity to unload the remaining shares in the UltraShort Russell (TWM). It just doesn't pay to hold these ultrashort shares and we don't see the fallout from a 2007 fraud case being long lasting. The case may gather steam and cause more damage then I expect, but we'll stay tuned next week. We added back to the Foster Wheeler (FWLT) shares that we sold for the Growth and Hedged Growth Portfolios last month and started a new position for the Opportunistic Portfolio. Technically FWLT is in a position to breakout with the 20ema crossing the 200ema and we like the future prospects for infrastructure growth. Asia and the Middle East (OPEC) should be ramping up now that world growth is flourishing. 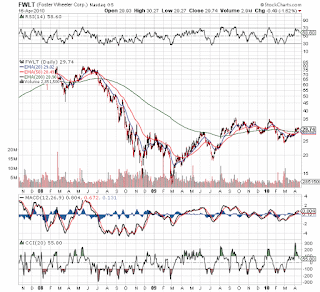 Best of all, FWLT is still considerably below the $80 high they hit in 2008. 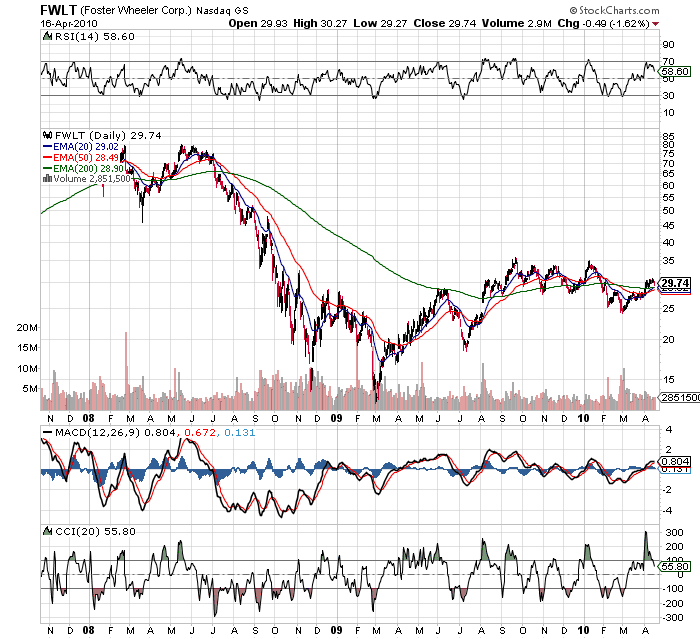 On the earnings front, FWLT made $3.73 in 2008 and they likely will retest those levels by 2012. The estimate for 2010 is that they'll make $2.33. We expect the $2.64 estimate for 2011 will likely go much higher. Jacobs Engineering (JEC) has the same earnings profile and it currently trades at $47 versus the $30 for FWLT. In our opinion, FWLT has upside versus the sector and the sector has upside versus the market.